3M Earnings Jump, but at What Cost? 3M's bottom line continues to improve, but the company isn't preparing itself for the future after making further cuts to R&D. 3M Co. (NYSE:MMM) continues to trudge along on a slow growth path that's become commonplace for industrial conglomerates today. The company's fourth-quarter earnings report showed very little in the way of organic growth, only to be masked on the bottom line by increasing margins and a falling share count. The strategy should be familiar to investors who have seen conglomerates such as Dow Chemical (NYSE:DOW) and Honeywell (NYSE:HON) use buybacks as a way to boost earnings per share. Sometimes, buybacks can mask more important problems at a company. Fourth-quarter revenue at 3M rose 0.4% to $7.3 billion, and on a local currency basis, revenue was up 1.6%. To put that growth rate into perspective, according to the St. Louis Fed, U.S. GDP is expected to post 3.3% growth in the fourth quarter, and the IMF expects global output to be up 3.1% for the year. In other words, 3M is growing more slowly than the overall economy. Despite the slow growth on the top line, net income was up 11.4% to $1.16 billion, and earnings per share (EPS) was up 13.3% to $1.88. Those numbers look impressive, but where the additional income comes from is concerning as well. 3M's SG&A spending fell 0.7% to $1.53 billion, and even more concerning is that R&D spending was down 2.6% to $421 million. R&D is the core of why 3M is the company it is today, and spending has been gutted over the past decade. With R&D spending down, I don't know how 3M will ever return to a significant level of top-line growth. Many investors focus mainly on whether a company's EPS is growing, and in 3M's case it is. But it's important to understand why EPS has continued to grow. 3M has been buying back billions of dollars in shares over the past few years and is spending more on dividends and buybacks than it makes in net income. Long term, this is unsustainable. 3M is adding debt to pay shareholders and neglecting investment in its core business. It's hard to see how that leads to any relevance in the long run. 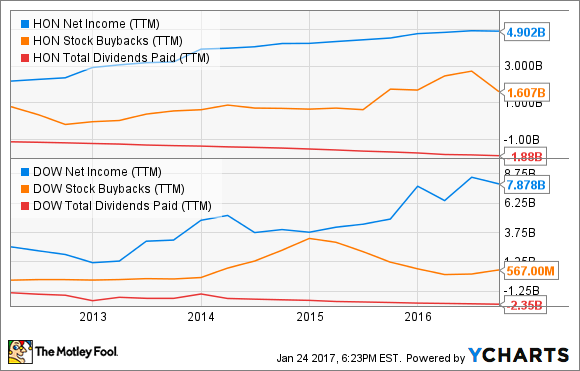 Comparing the same net income, buybacks, and dividend figures to Dow's and Honeywell's, you can see what competitors are doing differently. 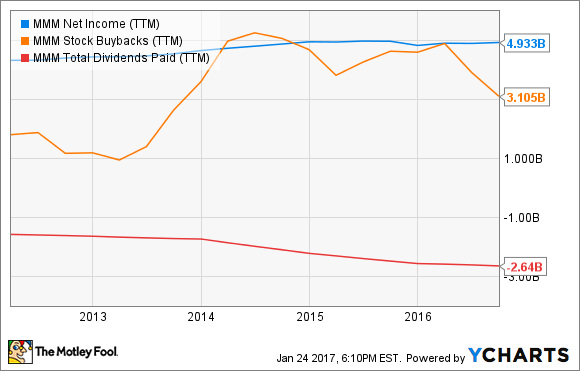 Both Dow and Honeywell have kept buybacks and dividends below net income. This is prudent, restrained use of cash, something 3M hasn't engaged in. HON Net Income (TTM) data by YCharts. If the argument could be made that 3M had some growth opportunity over the horizon or that the stock is extremely cheap, it would be easy to see why buying back shares with borrowed money would be a good idea. But 3M is gutting R&D and shows no signs of improving growth, on top of the fact that shares trade at a lofty 22 times trailing earnings. Industrial conglomerates have long been a relatively safe way to invest in the stock market and even collect a great dividend. But 3M's slow growth, lack of investment in the future, and desire to add debt to buy back shares has me worried about the company's future. Given the trends, the stock isn't as safe as it may appear.